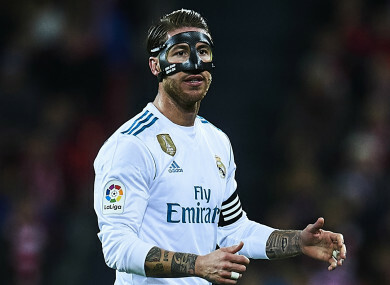 REAL MADRID DEFENDER Sergio Ramos set a new record for red cards in La Liga after receiving his marching orders for the 19th time in his side’s 0-0 draw with Athletic Bilbao on Saturday. The 31-year-old was shown a second yellow for leading with the elbow on Aritz Aduriz in the 86th minute at San Mames. Ramos’ dismissal – his second of the campaign - took him clear of former Barcelona and Sevilla defender Pablo Alfaro and Real Zaragoza legend Xavi Aguado. But the late sending off compounded a frustrating result for Zinedine Zidane’s side as they missed a chance to close to within six points of leaders Barcelona. Head coach Zinedine Zidane said he was disappointed for his players but remains satisfied with their efforts following the stalemate. Victory would have seen Los Blancos close the gap to Barcelona back to six points after the leaders dropped points against Celta Vigo, but the champions were unable to find the all-important goal against a side which is now winless in six league matches. Cristiano Ronaldo, Toni Kroos and Karim Benzema could all have done better with first-half chances as Madrid’s scoring troubles came to the fore once again. It was the third time they have been held scoreless in this La Liga campaign and a worrying trend which has left them fourth in the table, still eight points shy of pace-setters Barca. “I am very happy with the performance and very disappointed not to score, but mostly I’m feeling disappointed for the players, as they gave everything,” Zidane told Movistar. “We deserved more and in the end we did not get the goal that would have given us three points. Madrid’s underwhelming evening was compounded by the late dismissal of Ramos for a second yellow after he appeared to catch Aritz Aduriz with an elbow. It means he will join Casemiro and Dani Carvajal on the sidelines for next weekend’s visit of Sevilla after they both picked up their fifth yellows of the campaign. “Ramos is not happy because he thinks it was not worthy of a card, but that is how it is and we cannot change it now,” Zidane said. Email “Sergio Ramos makes red card history in La Liga following Bilbao dismissal”. Feedback on “Sergio Ramos makes red card history in La Liga following Bilbao dismissal”.